Phlebotomy Handbook: Blood Specimen Collection from Basic to Advanced links students and health care professionals to the latest information on safe, effective blood collection. Progressing from simple concepts to complex competencies, the text covers all of the communication, clinical, technical, and safety skills that any health care worker will use in the practice of phlebotomy and other specimen-collection procedures. The 10th edition aligns the text with entry-level competencies of the NAACLS. A DVD video library demonstrating procedures described in this text is available in Pearson’s Instructor Resource Center. Diana Garza received her Bachelor of Science degree in Biology from Vanderbilt University in Nashville, Tennessee, and completed her Medical Laboratory Science certification requirements at Vanderbilt University Medical Center. Her interest in laboratory sciences and in teaching led her to a Master of Science in Education at the Peabody School of Vanderbilt University. She received her Doctorate of Education in Allied Health Education and Administration through a collaborative graduate program of the Baylor College of Medicine at the University of Houston. Dr. Garza’s laboratory and teaching experience continued at the University of Texas Health Science Center at Houston and, for many years, at the Microbiology Laboratory at the University of Texas M.D. Anderson Cancer Center, where she later became the Administrative Director of the Division of Laboratory Medicine. In 1990, Dr. Garza joined the faculty of Texas Woman’s University—Houston Center, where she taught Internet-based quality improvement courses and became editor of several journals and continuing education publications. Dr. Garza has served on numerous health care advisory boards, as a board member for many nonprofit health care organizations, and on nationwide committees in the field of laboratory medicine. 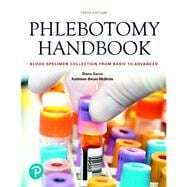 She continues her writing and editorial pursuits primarily in the field of phlebotomy. Kathleen Becan-McBride received her Bachelor of Science degree in Biology from the University of Houston; completed her medical laboratory science education at St. Luke’s Episcopal Hospital in Houston, Texas; and earned national board certification as a Medical Laboratory Scientist. While working at St. Luke’s Episcopal Hospital Clinical Laboratory, she received a full scholarship to the University of Houston/Baylor College of Medicine collaborative Masters in Allied Health Education and Administration Program. Dr. Becan-McBride completed her Doctorate in Higher Education and Administration while teaching in the Medical Laboratory Science program and Physician Assistant program at University of Texas Medical Branch Galveston and Medical Laboratory Technician program at Houston Community College. She then became a faculty member and Chair of the Clinical Laboratory Science Department at UTHealth. In more recent years at UTHealth, she was Director of Community and Educational Outreach, Director of Workforce and Resource Development, and Professor in the Medical School Department of Family and Community Medicine. Dr. Becan-McBride has published 24 books and more than 57 articles. She has served on numerous national and international health care advisory boards, several editorial boards for health care journals, national and international committees and commissions, and educational advisory boards for medical laboratory science educational programs and community outreach programs. She was the elected Chair of the ASCP Board of Certification Board of Governors from 2008 to 2010 and received the ASCP Mastership Award in 2012; ASCP Board of Certification Distinguished Service Award in 2012; and ASCP Mentorship Award in 2016. Dr. Becan-McBride continues her Texas Higher Education Consultant activities in writing, presenting, and editing, mainly in the expanding area of blood collection.